(NewsUSA) - Sponsored News - Wine lover? Nature enthusiast? Both? Argentina and Chile, with unparalleled biodiversity and distinguished wines, are ideal journeys for you! The two countries share the majestic Andes, the longest natural border in the world. Weave through these mountains, which connect diverse ecosystems, and relish the geographic extravaganza of contrasts. Opportunities to see native, even rare, bird species abound, as does exploring vineyards and wineries. Wildlife and plants fill your senses and extraordinary wines fill your glasses, making each day amazing. There's Mendoza, for example. You'll find exquisite olives, fruit and cheese here, too, but it's mainly about the wine. Imagine yourself sampling Argentine Malbec or Pinot Noir in a vineyard perched over 4,250 feet in the foothills of the Andes. You may even spy a massive Andean condor soaring overhead. East of Mendoza, the vast scrub plain of the Monte Desert boasts unique crested and sandy gallitos, endemic Steinbach's canastero, and cinnamon warbling-finch. 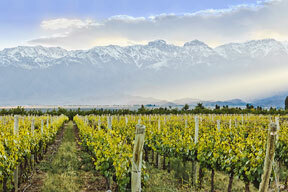 On the other side of the Andes from Mendoza lies Chile's Maipo Valley, famed for its Cabernet Sauvignons and Carméneres. Wind through the verdant landscapes of Chile to sample its distinctive wines and indulge your inner naturalist. Don't miss the vineyards of Concha y Toro, producing some of the New World's best Cabernet Sauvignon. Explore its mythic Casillero del Diablo, or Devil's Cellar. Legend has it that a former landlord started the rumor that the devil himself was seen there, thus salvaging his personal wine inventory from theft and creating one of the most powerful legends in the wine world. Take in Chile's Colchagua Valley. Its name is from the native Mapuche word, colcahuala -- "nesting place of the sacred Huala bird." Nestled here are premium wine properties ripe for exploring and tasting. At Altos de Lircay Nature Reserve, be on the lookout for woodland birds such as owl, woodpecker and hawk species, plus white-throated treerunner and the quasi-endemic chestnut-throated huet-huet. Further south, a trip to Patagonia will leave no doubt as to why it's one of the prime spots in the world for whale watching, hiking and horseback riding. This region is teeming with natural splendor -- in lush landscapes, along coasts and desert, and in a protected breeding colony of Humboldt penguins. Sophisticated Buenos Aires and Santiago round out the journey. Travels are enhanced by expert guides and like-minded aficionados. Distinct options for immersive tours to Argentina and Chile are offered by International Expeditions. IE is a pioneer in imaginative, sustainable experiences within the confluence of ecotravel and luxury travel. Their naturalists and enologists enrich your days with knowledge about the region's wine, wildlife, avifauna, history, folkways and foodways. Start to immerse yourself in Argentina and Chile, and other destinations combining adventure, nature and cuisine at ietravel.com.